Comanche Red River Hotel Casino is committed to actively serving each of the very special communities of which they are a part. To celebrate and recognize the people in our community who volunteer time, expertise, resources and financial assistance to organizations that help empower people and causes of our community, we’ve created the campaign #LiveitComanche. Living it the Comanche way means living life to its fullest in a way that benefits everyone! To join in the cause and join in on the fun, please share your stories of people making a difference in the community with all of us by tagging your post or tweet with #LiveitComanche when you post on Facebook, Twitter, Instagram and Google+. When you use the hashtag #LiveitComanche, we can further support worthwhile efforts and share successes with as many people as possible. Did you or your family do something charitable? Don’t be shy about letting us know! The idea for #LiveitComanche was born from the desire of Comanche Nation Entertainment associates to recognize and give thanks to those that serve our community. Our campaign mission to recognize those that contribute to the betterment of our communities and the people within. Stay tuned for the annual #LiveitComanche awards! The other half of the #LiveitComanche campaign is showing pride in your favorite Comanche casino! We get excited about our fans showing us some love and we’ll show you some love right back. Include #LiveitComanche along with photos of you wearing your Comanche Red River Hotel Casino t-shirt (for example) or holding up the gift of the week. We’ll re-post the best examples of casino pride for the whole community to see! 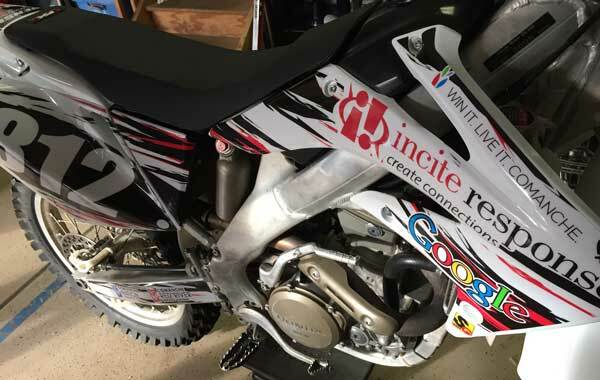 #Liveitcomanche – Tricked out my bike with Comanche logos. It’s faster now.